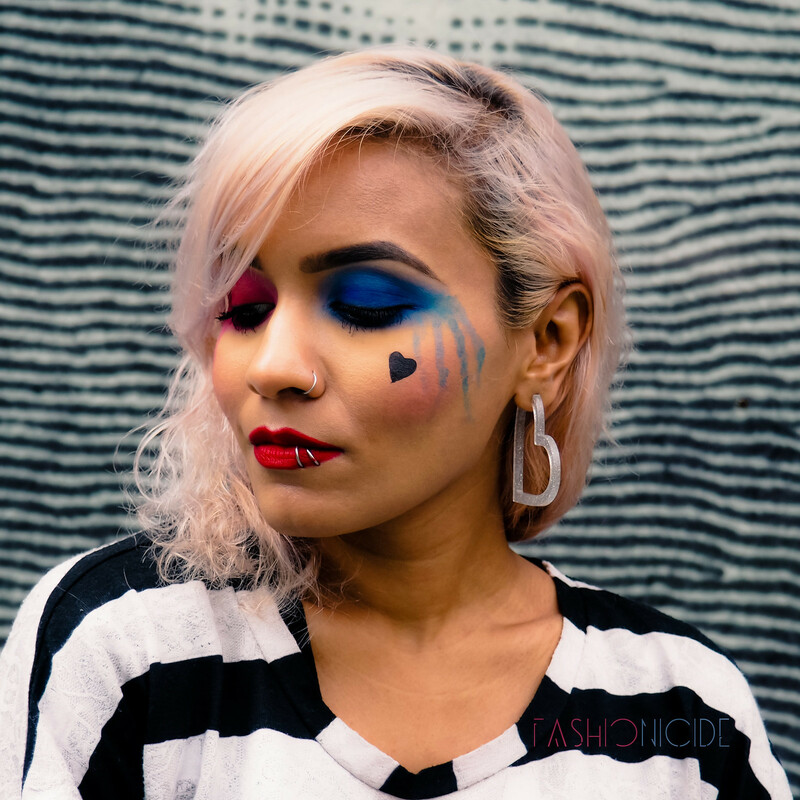 MAKEUP // What Would a Brown Harley Quinn Look Like? I've always had a bit of a thing for Batman. When I was a kid, I was always in front of the TV on Saturday mornings watching the Animated Series - I just couldn't take my eyes off the screen for those 20 odd minutes. My favourite character was Harley Quinn, such sass, such style, so ruthless but also so cute! I actually went through a bit of a period a couple of years back where I basically re-watched every episode, and rekindled my love for Harley and Mister J. 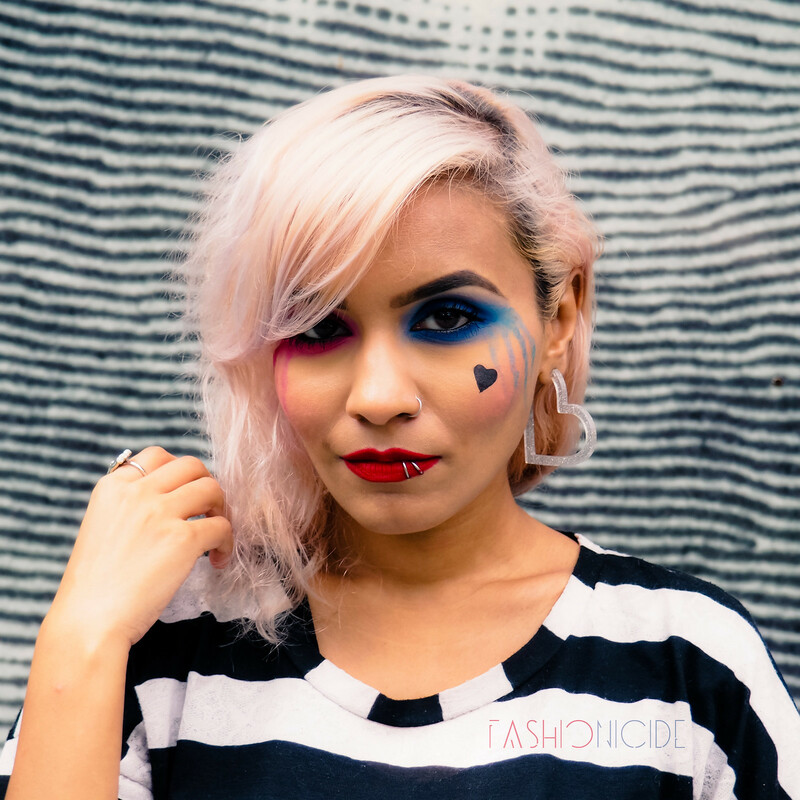 So imagine my excitement at seeing the Suicide Squad trailers, with a real-life Harley Quinn! Obviously I was curious about how the movie would try to capture her makeup, something which plays a huge part in her supervillain disguise. And they did not disappoint. She doesn't quite look the animated series of old, which is no bad thing actually, but more an evolution on that. The look is much more flawed and less perfect than the animated version, and I absolutely love it. Naturally, I thought I'd pay homage to Harley with a look of my own. Although I've skipped out on the face whitening part, and just focused on the eyes, replicating the pink and blue for the eyes and adding in my own style of teary streakiness. My look is also a lot cleaner, as aside from her eye makeup, her overall look is a bit too 'crack whore chic' even for me! My method was pretty simplistic: apply red eyeshadow to the lid and lash line of one eye, blue eyeshadow to the other and smoke it all out! For the tears strolling down the face, I dipped a thin brush into the eyeshadow pan, loaded it with colour and drenched the brush tip in water, then I just used the brush to paint on the tears! It's so easy, but really effective, as the water (obviously) waters down the colour ever so slightly and gives it a watercolour effect! As for the film itself, Harley and Deadshot really stole the show. The script wasn't great, the storyline was pretty poor but despite that it actually turned out to be a fun film - just don't expect it to be Oscar worthy, and you'll probably enjoy it! Extremely cool look! Love the blue colour. Just saw it, I love it! 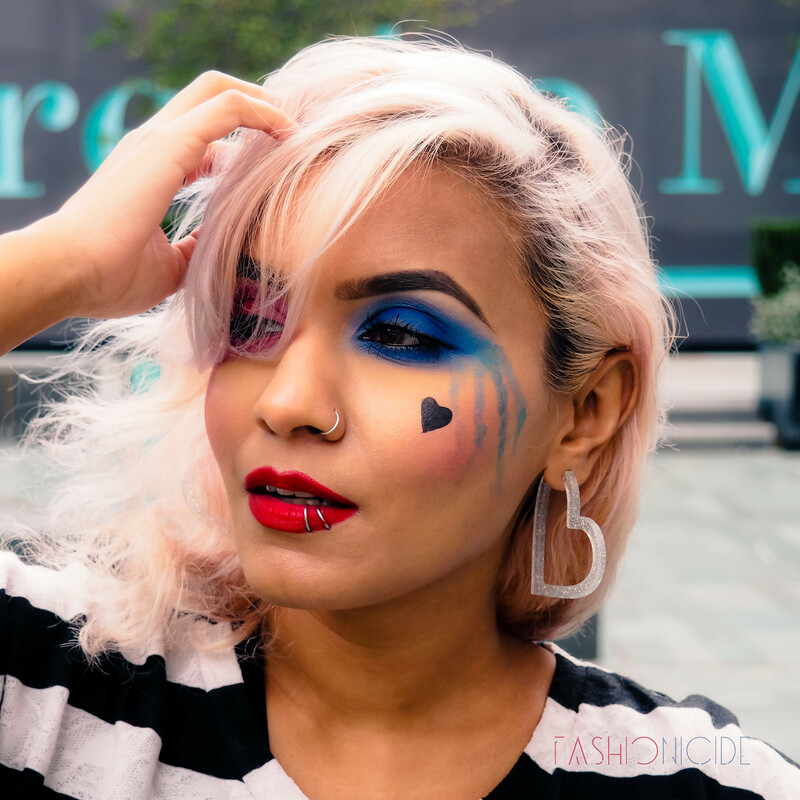 Loving this blog, your makeup and fashion looks are the best! 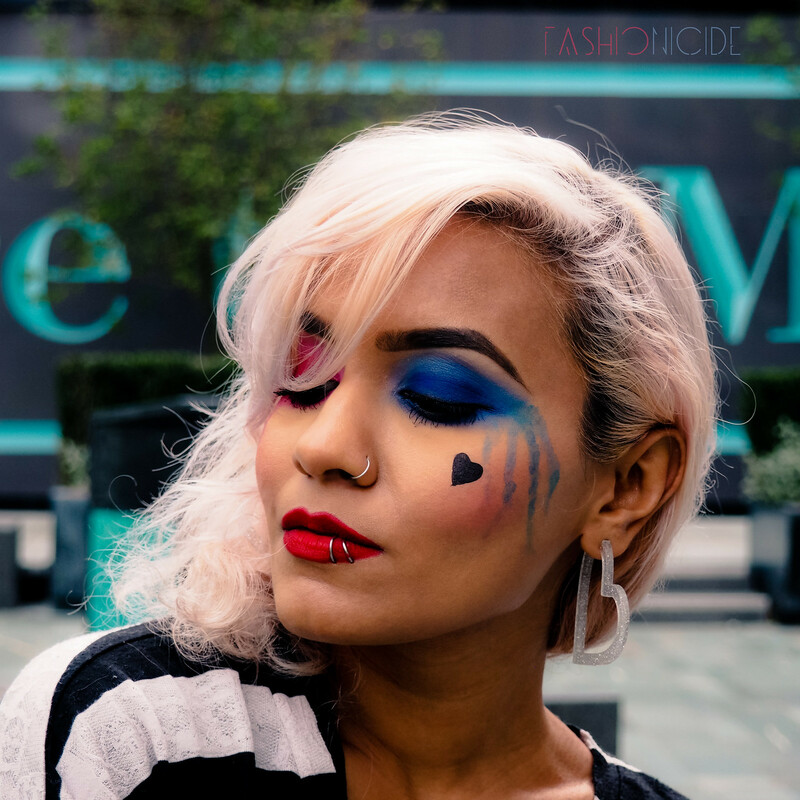 I love your interpretation of Harley make up! I probably won't watch Suicide Squad, I'm tired of those films, even if I was a keen comic book reader (and cartoon watcher) as a kid.